If you want to search all Digital Collections, it’s best to search our main Catalog. Use the search box at the top of the page or click HERE. You will need your library card and PIN to checkout digital materials. You may need to download free software for some suppliers. Mobile apps for some resources are available. See the complete list HERE. OverDrive Online library of downloadable audiobooks, eBooks, and magazines available anytime, anywhere. Download directly to your computer or portable device such as iPads, iPods, tablets, smartphones & MP3 players. OverDrive Help Guide. NOVELNY is an online library of literally hundreds of magazines, newspapers, maps, charts, research and reference books that are available to every New Yorker, free of charge. All you need is your public library card, New York driver license, or non-driver ID. Kids eReading Room Visit the Kids eReading Room to browse all of our downloadable titles for kids in one location. Driving-tests.org is a free online driver’s education program. **No library card required** Simply click the link to get started practicing for a NY DMV Permit Test. Teens eReading Room Visit the Teens eReading Room to browse all of our downloadable titles for teens in one location. Many of NCI’s popular patient education e-books are now available for download through Google, Barnes & Noble, and the US Government Bookstore. The e-books can also be downloaded from the Apple Bookstore. 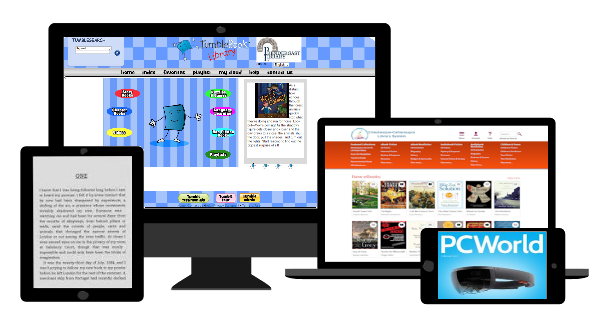 TumbleBooks for Kids Online collection of animated, talking picture books which teach your children the joys of reading in a format they’ll love! View in the library or on your home computer. TumbleBook Help Guide.